"There is nothing wrong to be a A’s student and get top grades. But you have to invest the same energy to learn about one of the most important part of our adult life: marriage. I have not met any person who had not at one point dreamed about having that perfect love. So if one has desired it at one point, why not learn how to make it come true?" said Chen. To increase marriage education and awareness for the public, Chen started a national "I Am Here For You" Movement. 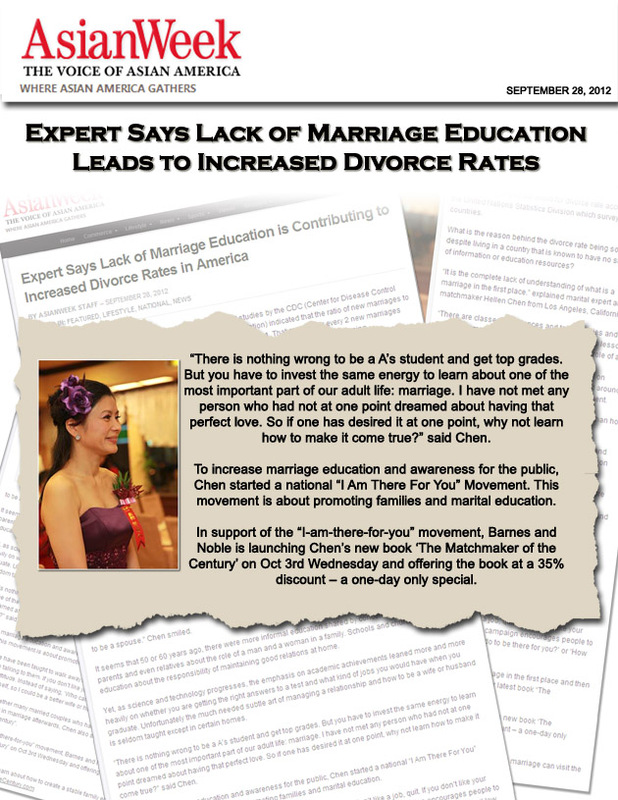 This movement is about promoting families and marital education. Chen said, "We have been taught to walk away from problems. If you don’t like a job, quit. If you don’t like your parent, just stop talking to them. If you don’t like your spouse, divorce. Thus this campaign encourages people to take a different attitude. Instead of saying, ‘Who cares?’ Why not say, What can I do to be there for you?’ or ‘How can I improve myself, so I could be a better wife or husband or parent or child?" In support of the "I-am-here-for-you" movement, Barnes and Noble is launching Chen’s new book ‘The Matchmaker of the Century’ on Oct 3rd Wednesday and offering the book at a 35% discount – a one-day only special.